Our style/training has a deeper philosophy than just learning how to kick and punch. Tang Soo Do teaches respect, integrity, and building character. We follow set Tang Soo Do guidelines and principles that guide us to become better martial artists, as well as individuals. We provide a family friendly and positive learning environment for our students, and encourage our students to never stop learning. Blair School of Martial Arts LLC is a member school of the International Tang Soo Do Federation TM (I.T.F.). We teach traditional Tang Soo Do. The basic ideology of our martial art is the "Harmony between the Mind and Body." Findings have indicated that Tang Soo Do was practiced over 1,500 years ago. "Tang Soo Do is widely recognized as the Traditional Martial Art of Korea. For this reason, the International Tang Soo Do Federation places a primary emphasis in maintaining the traditional aspects of our training methods..." (International Tang Soo Do Federation Student Handbook). The I.T.F. is an organization, located in Monroeville, PA, founded by Choong Jae Nim Grandmaster Chun Sik Kim in 1984. The "...Federation was formed by Choong Jae Nim Master Chun Sik Kim to maintain the high standards of authentic Tang Soo Do..." (itftangsoodo.com). 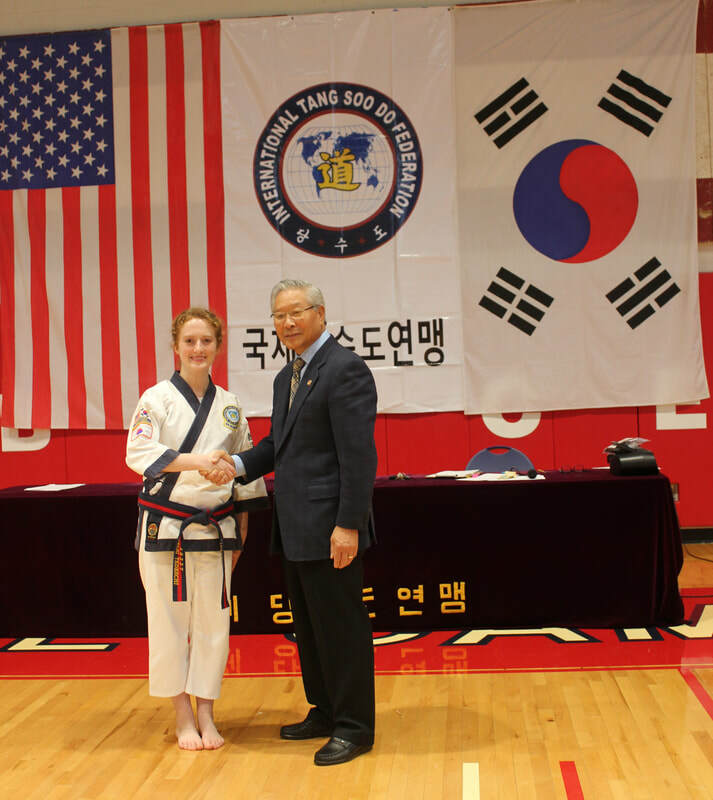 Throughout his lifetime, Choong Jae Nim Grandmaster Chun Sik Kim has displayed his great loyalty and dedication to preserving and ensuring the practice of authentic Tang Soo Do. The I.T.F. sets standardized teachings of authentic Tang Soo Do. Member schools follow such guidelines and standards established by the I.T.F., ensuring consistent training of traditional Tang Soo Do. Member schools are required to be registered and certified by the I.T.F., and instructors are required to recertify their rank. By being a member of the I.T.F., a student can feel a sense of great pride and accomplishment by achieving a rank through an accredited organization. Visit the International Tang Soo Do Federation's website to learn more information. Blair School of Martial Arts is also a proud member of the Blair County Chamber of Commerce.